The last version of Windows is here, and Microsoft is setting its bar high this time looking to have a billion devices use their new flagship OS by 2018. About a month ago, anyone running Windows 7 or 8 (or the Windows 10 insider preview) found that little tray icon telling them they can reserve their copy of Windows 10. Heck, even pirates get a free copy! So why is Microsoft so gung-ho on having almost anyone using Windows to upgrade to their latest OS, even making it a free upgrade? Looking back, it's safe to say that the launch of Windows 8 wasn't exactly what Microsoft anticipated. Microsoft, always looking forward, assumed they could push touch based computing to the next level with an OS meant for all platforms. We all know the saying about making assumptions. Windows 8 on the desktop was almost universally reviled (except by the Escapists current Community Manager!) because it not only compartmentalized the desktop into a non-default screen but removed the beloved start menu! Sure, it existed on the desktop page to an extent. But it was clearly a shadow of its former self. Because the OS was so specifically designed for touchscreen use by tablets and phones, it was clear that nothing about the OS was designed for a keyboard and mouse. Windows 10 is their attempt to bring the ease of use on a desktop environment from Windows 7 and the touchscreen and tile design of Windows 8 together as some sort of hybrid best-of-both-worlds design. It's become apparent that when it comes to Microsoft OSs, the leapfrog approach is the best way to upgrade. The pattern is fairly obvious to those who've used Windows for most of its life. Windows 95, WinME, Windows Vista, Windows XP, Windows 7, Windows 8, Windows 10. I'm not sure if it's intentional, but given Microsoft said this would be the last version of Windows, they could be trying to have it go out on a high note. To make sure Windows 10 is as attractive as possible, it includes an arsenal of new features that will make even the most stubborn Windows 7 user upgrade to the new flagship OS. A new Internet Explorer replacement called Microsoft Edge will take over as the included internet browser, a voice interactive virtual assistant similar to Apple's Siri called Cortana and Xbox Live account integration which allows you to stream your Xbox One games on your desktop. Once the installation is completed, the first thing you'll see is everyone's little buddy, the Start menu, has made a return! 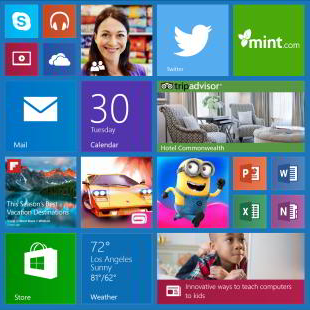 If you're expecting the same ol' Start menu, think again. Microsoft gave it a little ModernUI touch-up before relaunching it. The program list is still present on the left part of the menu, while the full screen live tile display from Windows 8 is now placed in a resizable and customizable frame on the right side. This gives you more space to de-clutter the icons you have spattered all over the desktop and organize them in the new start menu. The Start menu's return is a refreshing sign that Microsoft listened a little bit to customer feedback about Windows 8. The live tile's can be sized to a small, medium or large tile size, allowing you fine tune the live tile menu as you see fit with your program shortcuts and widgets. "All Apps" replaces "My Programs" and also includes any apps you've downloaded from Microsoft's Marketplace. The Settings window is the new control panel window. If you're used to frequenting the old control panel, it'll take a little time to get used to, but for most folks, it's fairly straightforward and easy to use. You may find yourself spending far too much time simply customizing your start menu, similar to how you arranged your desktop icons in the past. The ability to add widgets such as tracking your local weather or next planned trip are pretty handy to have listed. Overall, I'm a big fan of the new Start menu. There's so much that can be done to personalize it to your liking and usefulness, that looking at the old menu now feels like a step backwards. The other addition you'll see after finishing the installation is a big search bar beckoning you to "Ask me anything". Meet Cortana, Microsoft's answer to Siri. Cortana takes over as your windows search bar. When you search for an item, it not only looks on your system, but on the internet and Microsoft's marketplace as well. Type in "calc" and it will give you a result of the calculator program installed on your system, search results from Bing and Marketplace apps that are calculators. It's quite handy, if not a little to get used to. I accidentally downloaded a new calculator program when I quickly typed in "calc" to bring up the one on my computer already. Cortana isn't just a search bar; it's also voice recognition software to assist you in your searches. I'll admit, I'm terrible with voice recognition software. Anytime I've used it in the past, it's never really worked for me. But Cortana was different. Each phrase I asked it to search for it found without issue. Though, it did give me an error when I asked it to open the Settings window. I'm guessing since it has its own Settings page, it confused it with your systems Settings page. 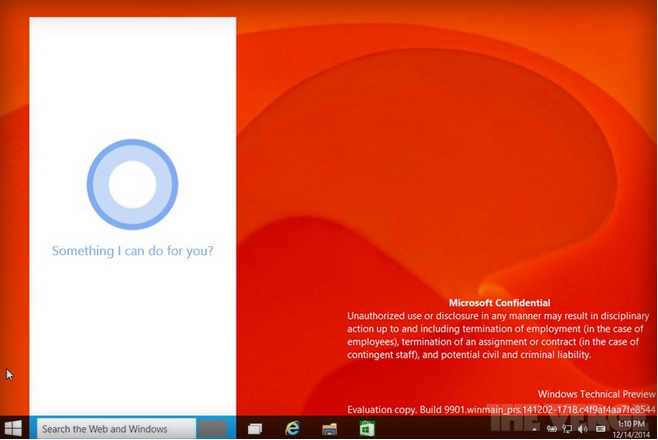 There is a variety of commands you can give Cortana to do for you on your system. A few examples would be "remind me to pick up the kids at 3:15pm" or "remind me to pick up milk when I go home". Cortana's little window will also show you your local weather, news, sports scores and other options such as emails, flight itineraries or other more secure options should you allow it to. It's clear that Microsoft put a lot of thought and effort into this new feature, and it's definitely one of Windows 10's biggest new features.